HOW TO CHANGE THE RESOLUTION TO GET THE BEST OUT OF THIS SITE. CHANGE IF YOU INTEND TO STAY LONG. 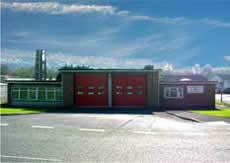 This is a Picture of Ammanford Fire Station which I have animated in Flash. Two Fire Appliances are seen turning out. They arrived in 2003 and are Dennis Sabers. This link shows past firemen and firewomen and gives a brief history of their formation and the station. Community Fire Safety is the new buzz word for the old term Fire Prevention, which for one week a year was termed Fire Safety Week where the public was instructed in fire awareness. This is divided into the old and new. This is Ammanford's account of those bitter days of 1977 and 2003. There are no photos of 1977 (except for the Round Tablers) There were no scabs. Our bitterness was and always will be with the employers and government. A collection of sections covering, Presentations, Awards, Promotions and Stories of those Retired. 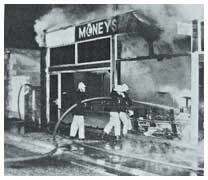 The basis of this site and the fires they attended. This is a parting gift to those firefighters of time gone bye. It is fairly comprehensive, from a time long ago, to my retirement in 2004. Further early days may be included when Mr. Howard Locksmith publishes a forthcoming book and he grants kind permission to add items that are relative to my resources. Past newspapers have been researched to include important articles before the wide-ranging use of the camera. The later editions use the camera extensively, and here I have included the articles which accompany photos which also seem to be the most serious of incidents. Because the site is so extensive I have colour coded my sections. I am aware that this is not thought well in the eyes of Web Designers but I think it makes it easier for the surfer in this case. Thirdly the Ammanford Library for allowing me to research the past papers and giving me valuable assistance. I'd like to thank those who contributed in Photos, Stories and their cherished Memories. Last and not least, Hugh Gillings, for teaching and encouraging me in advanced web design during night school at the Ammanford Campus. This site and all photographs and information within this site, are the sole copyright of the Webmaster and property of the Newspapers from where the articles derive. If reproducing, all or parts of the material, for personal "non-commercial" or "commercial" use, you must acknowledge the Ammanford Guardian as the source thereof by first obtaining permission, and including a reference to this site (http://www.ammanfordfirestation.org.uk) and abide by the copyright notice, Copyright © Derek Norman 2004, in the reproduction. Text, photographs, animations, graphics, data, etc. are subject to copyright, and are either the property of the creators, or used under license from the Webmaster.